Y’bneth is a tank warrior who can catch people in its branches and hold them still for a punishment. The first tree to walk the Antaris Battlefield can gather enemies together with Branching Out before piercing them with Wicked Thorns and knocking them up with Redwood Rush. The creature can additionally enter a slumbering state, protecting itself while bombarding enemies with seeds. Durable – Y’bneth has some impressive defensive stats, allowing him to take quite a bit of punishment. His kit incentivises building up HP, allowing for a rather sturdy presence on the battlefield. Lots of Control – Every one of Y’bneth’s four abilities offer some sort of crowd control effect to those affected. 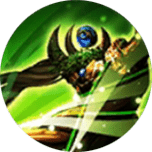 With stuns, slows, and a knock up at his disposal, Y’bneth will be able to lock down opponents and leave them helpless. Can Easily Regenerate Health – Every 15 seconds, Y’bneth simply has to find a bush to walk into in order to heal for a pretty substantial amount of health – and you don’t have to stay in there to get the full health treatment. Even in fights, there is often a bush nearby to jump into so that Y’bneth can keep going. Short Range – While its abilities allow it to reach out to a medium range, Y’bneth is vulnerable to ranged attackers like marksmen or mages. Nature’s Realm in particular leaves the tree beast helpless to ranged heroes while channeled. Less Effective Solo – Y’bneth’s abilities are all more effective when used against multiple opponents rather than taking anyone on solo. Be it minions or heroes, Y’bneth needs enemies around to maximize his full potential. Though Y’bneth is great against multiple heroes, the inability to immediately use Redwood Rush (and conversely, the ability to spam it after the fight begins) can make Y’bneth difficult to play in a support/main tank role. With proper ability control, however, it can be done. Harass enemies often with Wicked Thorns, building stacks toward Redwood Rush. 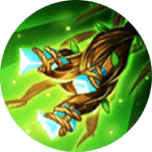 Use Branching Out when the enemy is in the minion wave to ensure the additional damage and stun effect that comes from striking multiple units. Roam the battlefield to set up ganks whenever possible. Y’bneth’s wealth of control effects make it a great tool for trapping enemies and ensuring kills. Wicked Thorns scales better with each rank put into it and so should be focused over Branching Out. While a useful bit of control, Branching Out only gains damage with each rank and thereby should never be a priority when leveling. Take ranks in Nature’s Realm whenever possible. 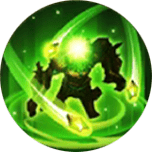 It is a powerful AoE ability that can contribute a lot of damage in team fights. Harass the enemy with Wicked Thorns, building up toward Redwood Rush. Slam them together with minions using Branching Out when able, stunning them in the process. If the fight continues, use Nature’s Realm to regain some lost health while dealing out some steady damage or pressuring the attacker away. Catch as many members with Branching Out as possible, stunning them and grouping them together. Follow up with Wicked Thorns and Redwood Rush to damage as many as possible. Slow the discombobulated foes by following with Nature’s Realm, bombarding them with seeds as your team moves into the fight. Y’bneth is really going to struggle if needing to run from a fight. The only movement ability available to it is Redwood Rush, and that requires some set up. Stun with Branching Out when able or slow with Wicked Thorns before running away. 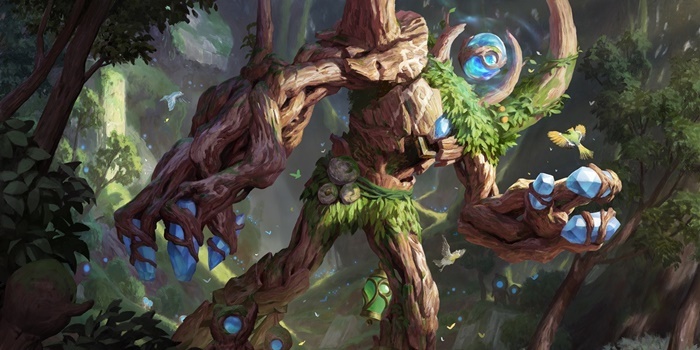 Natural Affinity – Passive – Y’bneth regenerates 32 (+15 per level) HP and 10 (+2 per level) mana every second while standing in bushes (with a 15 second cooldown,) but the effect immediately stops if Y’bneth is attacked during regeneration. Move into bushes whenever possible to keep your health topped up and make the most use of the ability as possible. Wicked Thorns – Y’bneth extends its limbs, dealing 250/300/350/400/450/500 (+0.8 AD)ˀ physical damage and reduces movement speed. After Y’bneth hits enemies 5 times with any ability (a hit is counted twice if it lands on an enemy hero) this ability becomes Redwood Rush. Redwood Rush: Y’bneth gains a shield with 8% of maximum HP points and charges forward, dealing 270/310/350/390/430/470 (+0.8 AD) physical damage and knocking enemies back. Poke enemies with Wicked Thorns as often as possible for regular damage and to ensure that Redwood Rush is available as often as possible. Branching Out – Y’bneth deals 240/310/380/450/520/590 (+0.95 AD) physical damage to all enemies in an area in front of it and gathers them toward the center. If this ability hits 2 or more enemies at once, enemies take 50% additional damage and are stunned for 1 second. This ability is a great way to trap enemies in continuous AoE abilities. Nature’s Realm – Y’bneth goes into a slumber, gains a shield with 20% of maximum HP points immediately, and creates a zone around itself, reducing the movement speed of enemies inside the zone by 60%. Y’bneth is invincible while in its slumber and summons seeds to strike enemies within the zone up to 20 times, dealing 60/110/160 (+1% of maximum HP) physical damage. If the seeds hit an enemy hero, Y’bneth is healed for 2% of its max HP. Enemy units are stunned for 1 second if they’re hit by seeds 8 times. Seeds will fall based on where the targeting area was when they were fired. As such, you will need to lead your shots in order to ensure thatt they strike their target. Keep a healthy distance from Y’bneth, as it will have a hard time dealing with enemies at a range. Spread out from allies to make it harder for Y’bneth to catch everyone in Branching Out. See all of Y’bneth’s item builds. Y’bneth will typically want to build rather tankily. Indomitable, Benevolent, and Bastion can help it is this regard nicely. Players may want to build up some of Y’bneth’s damage instead of survivability. In this case, Onslaught, Assassinate, and Skewer are the best choices. Y’bneth won’t have much problem with tanks, able to match their crowd control with its own. That said, it has very little reason to spar with tanks, as other tanks are rather low priority targets. Warriors will be disadvantaged against Y’bneth due to how well the tree beast can control units at close range. Harass and control them when able to ensure that your allied damage dealers will have an easier time dealing with them. Assassins will be harder to deal with than most other melee heroes as they can get their damage in quickly and move to where it’s hard to land abilities. Disable them quickly, however, and they will be easy targets once stunned. One of the bigger threats to Y’bneth, able to deal considerable damage from outside of Y’bneth’s influence. Be careful when facing them, making it a point to catch enemy mages in your control to ensure they are dealt with quickly. Another threat to Y’bneth if left unchecked. Marksmen will be able to deal out their damage from outside of Y’bneth’s range. Try to focus them quickly in fights to minimize the damage they deal. Supports won’t pose a huge threat to Y’bneth, it able to withstand most crowd control. In fact, it is better that a support goes after you than one of your allies, so try to provoke them in team fights. Nature’s Realm makes Y’bneth immune to crowd control, and thereby will make it practically untouchable to most support.